on delicious food created or tested in my kitchen;techniques and ideas, helpful hints, nutrition information with a nod to Weight Watchers. Paleo, gluten free, vegan - it's all here. Only things I love, and hope you will too. I picked up a bag of 5 very large, and almost ripe, avocados at Costco one day last week. They are absolutely delicious... is there anything more delightful than a perfectly ripe avocado? 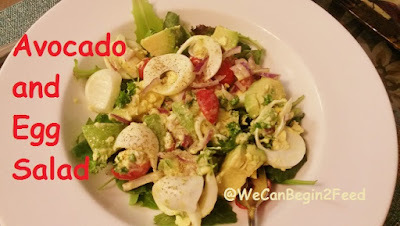 I have been trying to think of new ways to eat them up... and came up with this Avocado and Egg Salad for dinner. I want to try a few new things that I hope The Captain will enjoy as well. He is not always very keen on the creamy texture of plain avocado. In the Spring and Summer when we are spending more and more time outdoors, I keep some things on hand in the refrigerator to put together quick meals. Hardboiled eggs is one of my favorite go-to items... so while I washed and cut up some greens, The Captain peeled some eggs, and our dinner came together rather quickly. And it was wonderful! 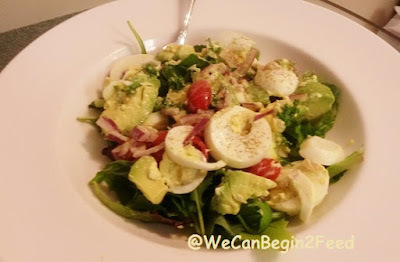 I am sharing the ingredients I used for 2 fairly large dinner salads. I think the next time I make this, I will try adding some crumbled bacon and some capers for garnish and a flavor boost. Put the tomatoes, red onions, parsley, cucumber, eggs, and avocado in a medium mixing bowl. Mix the dressing ingredients together in a small bowl and pour over the eggs, etc in the mixing bowl. Spoon the mixture over salad greens and serve with salt a pepper to season. Not only pretty but delicious and filling too! The Captain had some rye bread toast with his! If you are interested in learning more about the health benefits of avocados and other interesting facts about them, please check out this article called 13 Health Benefits of Avocado. Tell me you love avocados too! What is your favorite way to serve them? If you like this idea, I hope you will PIN it! Avocado is certainly a thing lately, isn't it? I've seen a few recipes for egg salad with avocado and I need to try it! Yum! I love adding avocado to the top of salads. Such a tasty and easy way to add some nutritional value and taste to otherwise traditional salads. Avocados are the best I love them in omelets too with lots of salsa. Your new site design looks great! 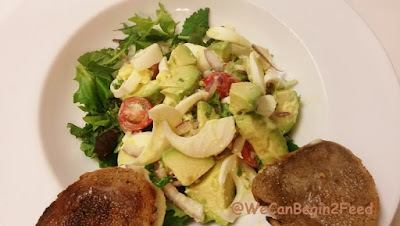 Avocado in any salad or even on its own is a win in my book. This salad sounds very healthy and delicious! I'm very knew to the avocado craze. I've tried them, but I think the ones I had were too ripe (too mushy) for my taste. I need to give 'em a try again. I do love hard-boiled eggs on my salads,though! I rarely go a day without avocado - it's one of my favorite things to add to salad or smoothies! This looks delicious! Eggs and avocado are two of my favorite salad ingredients. What a great idea for a salad! Looks delicious, I need to try this. YUM! Avocado and egg are like a match made in heaven! I can't get enough. Thanks for the recipe - another good way to pair up this dynamic duo. This looks great! And it reminds me that I didn't even make an egg salad after Easter this year! This is the first year that little man has actually wanted to eat hard-boiled eggs, and I didn't make enough to compensate for that! Yum! I use avocados in everything - I like to use them instead of mayo or mustard as a spread in sandwiches. I also like the creaminess in recipes where I'd normally put cheese since I'm dairy free at the moment. Yum!! I love avocado so much but actually haven't been eating that or eggs as much because of their higher point values. Need to try this salad for dinner one night though! Photographs by Elle. All photos and content not to be copied without express consent.. Powered by Blogger.